When comparing phone battery life, there are a number of factors to consider. While it may be tempting to immediately buy the phone with the highest capacity, the device with the biggest battery may not actually last the longest. In fact, a more efficient phone with a smaller battery can often give you a longer phone battery life at the end of the day. We took a look at the Galaxy Note 8, iPhone X, and Galaxy S9 in order to determine which of these new phones comes out on top when it comes to phone battery life. At first glance, it seems a near-guarantee that the iPhone X battery life would be a lot shorter than the Galaxy phones, just due to the lower capacity at 2716mAh. This seems like it’s a lot lower than the majority of modern, high-end smartphones, but the truth is that Apple has done a pretty good job of optimizing phone battery life and making sure that their devices last all day – or even longer – on a single charge. There are a number of factors to consider when it comes to getting a sense of how a phone battery life will perform. 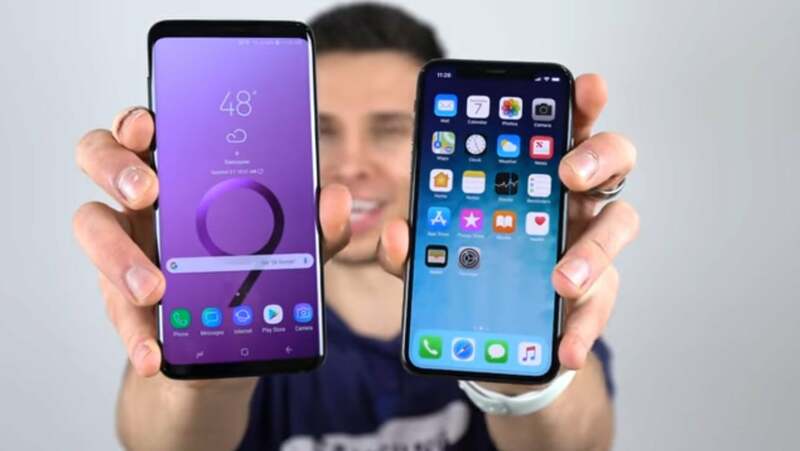 Obviously, the only way to know for sure is to run tests on the device, which we’ll get to below, but things like different screen sizes, resolutions, the processors used, and the mobile operating system can all have an impact on how the phone performs. In independent testing of all three phones, the results ended up being rather surprising. The iPhone X, while having the lowest capacity out of the three phones examined, had the longest battery life at 8 hours and 41 minutes on a single charge. 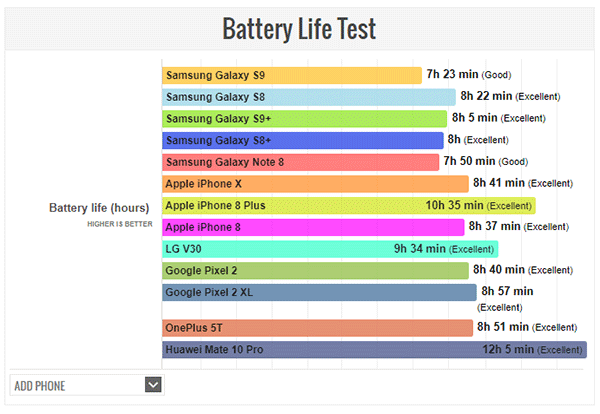 The Galaxy Note 8 came in second when it comes to phone battery life with a capacity of 7 hours and 50 minutes, with the Galaxy S9 bringing up the rear (just barely) at 7 hours and 23 minutes. This just goes to show how massive of an impact a different operating system and different specifications can have on a phone battery life. Despite the Galaxy S9 having a 3000mAh compared to the iPhone X with a 2716mAh, the phone battery life was more than an hour shorter than the iPhone. The phone testing also took a look at other high-end smartphones from the likes of Google, OnePlus, and Huawei – all of which performed better than the Samsung phones. 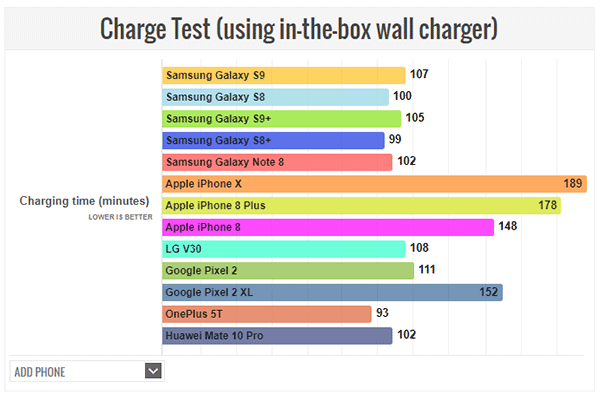 It may seem from this information that Samsung devices are inferior – at least in terms of phone battery life – but the Galaxy and Note devices do have an advantage in one key area: charging speed. While the iPhone X comes out on top when comparing the phone battery life of these three phones, both the Galaxy S9 and Galaxy Note 8 charge to full faster than the iPhone X does. That means that if your phone happens to die, you’ll be back on the road faster with the Galaxy or Note phones than you will with the iPhone. In this way, it evens out in a way when comparing these flagships. However, considering the majority of high-end smartphones will last all day on a single charge and that you can easily top off an iPhone X by plugging it in when you go to bed, we still feel like the iPhone X is your best choice – at least when it comes to phone battery life when compared to the Galaxy S9 and Note 8. At the end of the day, your choice between the iPhone X, Galaxy S9, and Note 8 when it comes to phone battery life isn’t necessarily an easy decision. While the iPhone X comes out on top with the longest single charge, the Galaxy S9 and Note 8 both feature faster charging that may close the gap between the devices. With the difference in battery life being about an hour between the iPhone X and the Galaxy S9, the difference is honestly pretty negligible in all but the most trying situations.